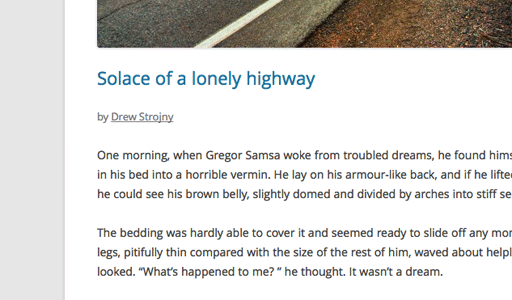 Working on the new default WordPress theme, Twenty Twelve, has been a very special, exciting, and humbling experience. We got off to a slow start earlier this year, but the pace has picked up significantly since then, and we’re now preparing to move the codebase back into WordPress core. We have a live demo of Twenty Twelve hosted over on WordPress.com! Twenty Twelve isn’t finished yet, but all the major styling is complete. The goal was to design a clean, minimal, and responsive theme, with a focus on typography and readability. I think we met that goal and I’m really happy with where we are right now. Take it for a spin and let us know what you think. Use the free open-source Google Web Fonts directory to load the font directly through Google’s external API. Package it with the theme and use CSS to load the font. We would have to ensure a GPLv2 compatible license in this case (more on this later). In the end, it was important to choose a great looking font with extensive language support. Whether we included it in the theme or not was a secondary concern. At the end of last year Matt and Lance contacted me and asked if I’d be interested in designing Twenty Twelve, the default WordPress theme for this year. I was of course honored and excited, and after some discussion about expectations and details, we started the project in relative secrecy. After a fast start, Twenty Twelve development slowed to a crawl in February (which was my fault) and in March we decided including it in WordPress 3.4 wasn’t a good idea. Since then we’ve re-focused, moved the Twenty Twelve repository to Github, and established a regular work schedule to ensure it’s ready for WordPress 3.5. Update! Twenty Twelve has launched. 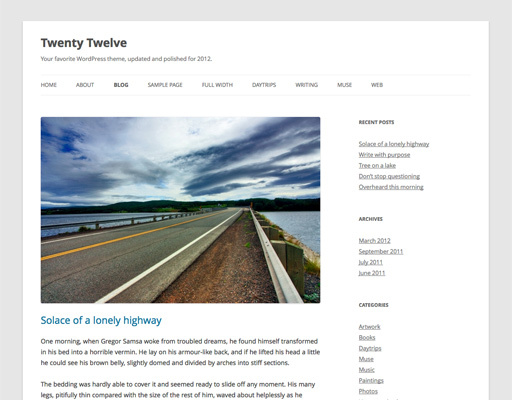 Twenty Twelve has launched and is now available in WordPress 3.5 and available for download in the WordPress repository. If Twenty Twelve is too basic for you, be sure to check out our WordPress templates or read our guide on finding the best WordPress themes.